Get funny in the woods in this pixelated remake of David Lynch's cult hit. Twin Peaks came close to redefining what viewers expect from a televisual thriller. What begins as a relatively straightforward murder investigation story quickly unravels into a dimension-hopping tale of the dualities, deceptions and general weirdnesses which power the small logging town of Twin Peaks. If dual lives and cherry pie are your thing, rock musician and indie developer Jak Locke has created an Atari 2600 version of the game (which will run on modern computers) that allows you to experience life in the troubled town first-hand. 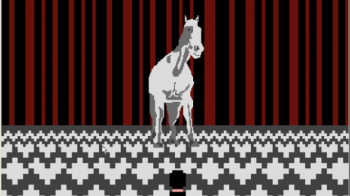 The game, Black Lodge 2600, lets you play as coffee-powered Special Agent Dale Cooper as he explores the mysterious, extradimensional Black and White Lodge. His doppelganger, and some local residents, pursue him as he moves from one room to the next. Fans of the show will be aware of the building's significance, and of what Locke is trying to achieve with Black Lodge 2600; it goes without saying that you should probably give the show a look before trying this game out (and even if you don't fancy the game, you should probably watch the show anyway. Like parallel dimensions and small-town America? It's for you). Black Lodge 2600 is available for PC download here, and you can get the Mac version here. A complete "instruction booklet" is included with each download.